The debate of Mutual Funds vs ULIPs has started again after the introduction of Long Term Capital Gains Tax on equity mutual funds and stocks in Budget 2018. Many investors want to know which one is a better investment option for long-term – Is it Equity mutual fund or ULIP? The 10% LTCG tax is not applicable on ULIPs (as of now). For tax saving under Section 80c, there has always been competition between Mutual fund tax saving product i.e, ELSS Vs Unit Linked Insurance Plans (ULIPs). From FY 2018-19 onwards, the Long term Capital Gains on ELSS funds also is taxable @ 10%. Hence, the investors whose main objective(s) are wealth accumulation and/or tax-saving have started comparing ELSS Vs ULIPs. Some insurance companies have already started pitching ULIPs against mutual funds after the re-introduction of LTCG tax. Before discussing which one is a better investment option, let’s discuss the major differences between these two financial products, as often, though, mutual funds are confused with ULIPs. So, ULIPs and mutual funds look like similar products, right? Let’s now understand the major differences then…. Based on the above features, it is obvious that the (new) major differentiating factor between ULIPs and Mutual Funds is TAX ARBITRAGE. The gains in mutual funds are subject to taxes. 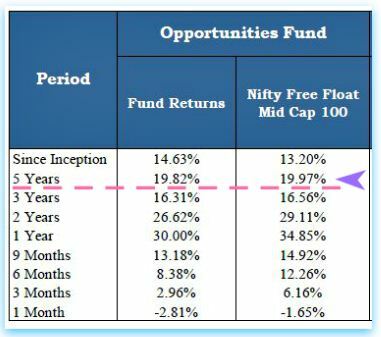 So, based on this one factor, can we judge that ULIPs are far better than Mutual Funds?? Let’s discuss…. As discussed above, ULIPs offer insurance and investment returns. So, obviously there are costs involved for offering both these features. A portion of the premium that you invest in an ULIP scheme goes towards providing life cover while the remaining gets invested in a Fund chosen by you. Mortality Charges : These charges are levied for providing life insurance cover. The Insurer may either deduct a portion of your invested premium (or) redeem/cancel the fund units to adjust for these charges. In case, you have adequate insurance cover and you choose to invest in an ULIP, you need to pay for mortality charges, for an insurance cover which you may not require. In case, you do not have adequate life cover, you need to pay a heavy premium to get it through an ULIP. Instead, a Term insurance plan can be a better choice for pure life cover. Other ULIP Charges : Most of the new age ULIPs are very cost competitive. These ULIP schemes charge just Fund Management Charges (FMCs). In case you opt for offline ULIPs, there are other types of charges that are levied. FMCs : These charges are levied for managing the Funds offered by the Insurer. These can be in the range of 1 to 2% for online ULIPs and more than 2% for offline Products. Example 1 : Below is the charges description for online ULIP plan called HDFC Click 2 Invest. 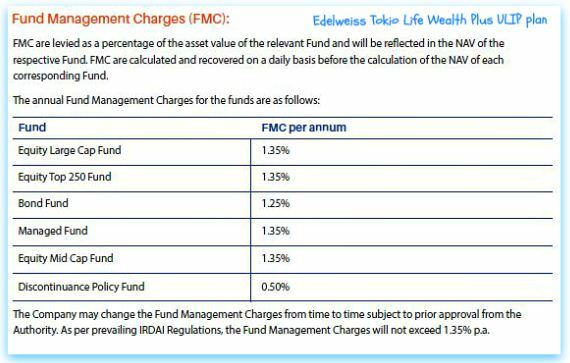 Example 2 : Below are the FMC charges of Edelweiss Tokio Life Wealth Plus ULIP plan. This plan charges different FMC for different funds. It is often observed that the most debatable point between ULIPs and MFs is ‘the cost structure’. With the introduction of online ULIPs, the costs of ULIPs have come down significantly. But, direct plans of Mutual funds can match their cost structure. Charges for Insurance Cover : As MFs do not offer any insurance cover, there won’t be any Mortality charges. The main charges that are involved in MFs are Fund Management Charges. These can be in the range of 1 to 3%. For example : The expense ratio of HDFC Mid-cap opp fund Direct plan is 1.21% and its Regular plan has an expense ratio of 2.26%. The way performance returns are calculated in mutual funds is more transparent than in ULIPs. 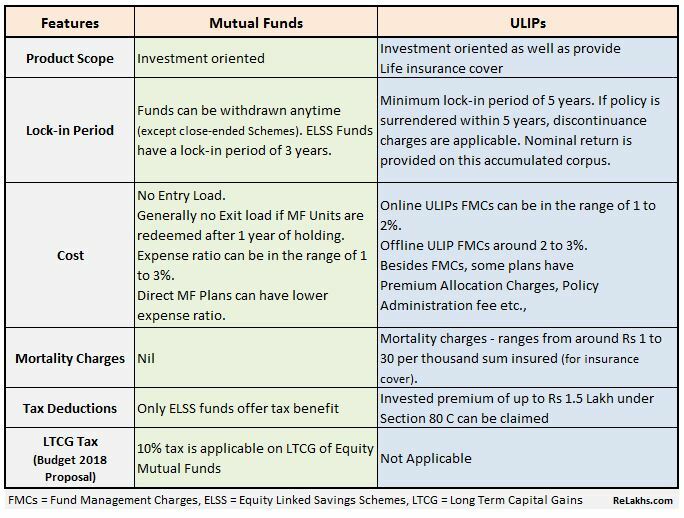 The returns data given in ULIP product brochures can be net off FMCs but exclusive of Mortality charges, Premium allocation charges and other charges (if any). To arrive at exact returns on your ULIP, you need to deduct all types of charges and then arrive at accurate returns. Whereas in Mutual funds, returns calculation is very straight forward, it is based on NAV, which is net-off all applicable charges. Mutual Funds are more transparent in terms of accessing information related to investment style, portfolio composition and past performance data. The performance of your ULIP depends on the type of fund chosen by you. If we compare the 5 year returns – HDFC Click2Invest’s opportunities fund has generated around 19%, Benchmark index returns have also been around 19% and HDFC Mid-cap opp fund has generated returns of around 25%. So, if returns from Equity funds are better than ULIP Funds then it is prudent to invest in investment products which give taxable returns but perform better than products which are tax free but give low returns. In such a scenario, the tax advantage enjoyed by ULIPs may not be a great deciding factor. In case, your ULIP fund does not meet your return expectation (under-performs), you do not have much choice than to switch to some other fund within the same ULIP. For example : Let’s say your invest in Edelweiss Tokio Life Wealth Plus ULIP plan – ‘Equity Mid-cap Fund’, which is a mid-cap oriented fund. If this fund under-performs, you can’t switch to another mid-cap oriented fund. You may have to opt for say a Large cap fund or diversified fund within the same ULIP. In case of non-performance of an equity mutual fund, you have plenty of options to choose from (it can be a different AMC, scheme, fund manager etc.,). Hence, mutual funds offer you greater flexibility and choice. Though switches among the various funds within an ULIP are tax free (does not attract capital gain), you have limited choice and may not meet your original investment objective/strategy. In case, you decide to buy one more ULIP, the mortality charges can be higher as it is based on the age of the policy holder. 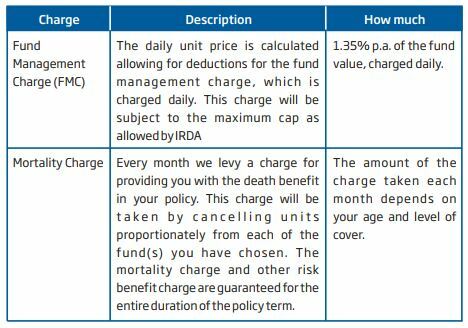 If you plan to make additional investment in ULIPs (Top-ups), mortality charges are applicable on these Top-ups as well, besides other ULIP charges. As per insurance rules, each top-up premium needs to be treated as a single premium contract. In other words, the extra money that you park in your Ulip also needs to buy you an insurance cover. Kindly note that the minimum holding period of top-up premiums is 5 years. Top-up premiums are not allowed during the last 5 years of the policy term. These kind of restrictions are not applicable in case of Mutual Fund investments. Let’s say a small retail investor plans to invest Rs 60,000 p.a in an ULIP for long term wealth accumulation. He/she can at best opt for an online cost-effective ULIP plan. But the entire Rs 60,000 gets invested (net-off applicable charges) in only one type of fund. Hence, no diversification (concentration risk) is possible. The same retail investor can pick two equity mutual funds schemes and can invest say Rs 2,500 per month via SIPs, which can lead to some diversification and can also get the benefit of rupee cost averaging. Kindly note that investing based on ‘tax‘ advantage only can be short-sighted decision. The tax laws may change in future. The next Budget (2019) may remove LTCG tax altogether (or) who knows they may include ULIP based Equity funds in the tax-bracket as well, to provide a level-playing field and remove the ‘Tax Arbitrage’. It is not prudent to invest in a bundled investment product. If your objective is to get adequate life cover, buy a pure Term insurance plan. In case, you would like to invest in equity oriented products for long-term goals, you may consider equity mutual funds or direct equity (stocks). Last but not the least, you will surely witness aggressive marketing of ULIPs by Insurers, bankers, advisors & intermediaries and try to highlight the tax advantage that ULIPs have over Equity Mutual funds. One of the main motivating factor can be their ‘commissions’. They get higher commissions on ULIPs than by selling mutual funds. There is no doubt that the cost structure of ULIPs is very competitive now and they have been improving drastically, but I still prefer mutual funds for long-term wealth accumulation. Let’s not forget the fact that a mutual fund house’s core competency is investment and the primary function of an Insurance company is managing risk.So, as an Investor, may be you are better off with Mutual Funds for Investments. Also, it is essential that you should consider the product cost, potential returns and your financial goals before selecting a financial product. Merely taking investment decisions based on tax advantage (or) disadvantage can be being short-sighted. Do you agree with my views? Kindly share your opinion. Cheers! This post is for information purposes only. We are not biased towards any insurance company or Fundhouse. Examples given in the blog are for the knowledge of users only. Mutual funds are subject to market risks. Thanks a lot for this write up. I came across this when I was trying to research about a ULIP that ICICI is trying to sell us. I have 3 questions. 1. I am an NRI, still an Indian citizen. I recently visited India and during a visit to the bank enquired about mutual funds. The relationship manager took that as an opportunity to explain about some of their funds and was pushing towards a recent fund which invests in NIFTY next 50 companies. We were in a hurry and so my husband just signed some documents and they said they will fill out the details later when we give our confirmation. Upon returning to our home, I have realised that they are trying to sell a ULIP but keep highlighting one of the funds that the ULIP will be investing in, which is really misleading. I’m going to have a conversation tomorrow that we do not want the ULIP. But if you could tell me how much of a trouble we would be in, since we signed blank documents? 2. 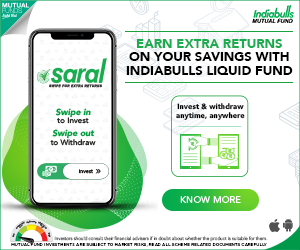 Is it possible to invest in mutual fund via online when we are away from the country? 3. If we like to hire a financial advisor in India, what would be the best channel to find such a professional? Will they provide services online or over phone? Do you, by any chance provide such services. Thanks again for this article and for patiently reading my comment. 1 – If your banker is working in your best interest, ideally, they would have clearly mentioned that it is an ULIP. If ULIPs are the best investment choice, why should not they reveal the product category name to you both?? So, kindly be careful before you sign on the dotted lines next time..take informed investment decisions.. In case, they have already submitted your ULIP application for processing, you can ask them not to get processed it. Even if it gets processed, you will have ‘free-look-period’ (generally 15 days), during which you can cancel the policy (some nominal fees would be deducted). 2 – Are you an USA NRI? Yes, you can invest in mutual funds online. 3 – Most of the new age Fee only financial planners provide their services through online/over phone. I used to offer one to one Financial planning services, but not now! 1. I am upset about the way they tried to sell ulip, honestly. I had to ask multiple times to make him confirm that this is indeed a ULIP. I’m guessing he will not proceed without our confirmation since we do not have any amount in our account for him to process it. Lesson learned: never try to make an investment the day before leaving the country, lol. 2. Sorry I’m in Australia. Kindly don’t take any chances.. You may send them a formal email/message that you are not willing to buy an ULIP as suggested. You have already made an investment decision, may I know your exact query? Hi Shreekath, Hope you’re doing well. I have 2 policy (1- Birla life income vision, 2- ICICI pru cash advantage) in both policy I need to pay 1 Lakh (50k in each) every year. so I thought to invest 10K per month in mutual fund for 1 year and after 1 year I’ll sell MFs and pay the premium for both policy. I’ve taken “tata mid cap growth fund reg pl” and investing 5K/month as SIP. As of now I’ve invested only 5K this month, is it good mutual fund? or what you’d suggest for my requirement. I am new to mutual funds so need your advise. Also pls advise one more MF in which I can invest 5K/month SIP bcoz currently I’m investing only 5K in tata MF. Or can I go for only one MF for 10K/month SIP, if yes, which MF is best suited for my requirement. May I know if you have adequate life cover (sum assured)? What is the total cover offered under these two policies? Birla Vision Life income plan is an Whole-life plan and ICICI Pru cash Adv is a money-back plan. These are traditional life insurance plans, the returns from these kind of plans can be around 4 to 6%. Kindly read : Traditional Life Insurance Plan – A terrible Investment option? 5 lakh sum assured in both policies. i have separatly taken tata life term plan for 1Cr. Icici cash advg. I took for newly born daughter this jan only. 50k yearly. For her higher education. Is this not a good option? Secondly, could you pls advise on my query for mutual fund. You may consider discontinuing both the existing whole life and money back policies and divert these premiums to equity mutual funds or other investment alternatives like PPF/Sukanya Samriddhi Yojana etc. A newly born child does not insurance. Invest in mutual funds for long term say 10+ years for your kid’s higher education or/and for your Retirement goal and not to fund your Insurance premiums. 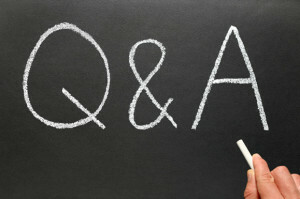 Just wanted to say thank you for writing such an informative guide on Mutual Funds. ! I’ve really enjoyed reading. I am very new to investment and as my friend suggested , I started my Mutual fund SIP for 3k every month for 3 funds . I have a lumpsum of Rs 3 lakhs now in my bank accounts .I need your help in investing. People say STP is good. I am a person with no ideas on STP.Can you please help me with this. I am not interested in FDs. Please recommend best investment method & save our hard earned money to get best returns. May I know your investment objective(s) and time-frame?? This is for my kids education and saving for future. And time frame is 6+ years. STP Process : One can invest lump sum amount in a debt oriented fund (preferably, Liquid or ultra-short term debt funds) and then set-up STP (Systematic Transfer Plan) to high risk Equity oriented balanced funds. The main benefit of STP is : Averaging of Cost – Like SIP, in STP too, a fixed amount of money is invested in the target fund at regular intervals. Kindly note that STPs can be set up between/across funds which belong to the same fund house only. Kindly note that STPs are treated as normal redemption, so any gains you make on Liquid funds is subject to taxes. So which is better to go ? SIP OR STP? Moreover, please let me know some good funds which I can invest. Another thing, I wanted to ask you is Can’t we invest in good stock? You may go with STP as you have to invest a lump sum corpus. Besides your existing three funds, you may add one balanced fund like HDFC balanced fund to your portfolio. I do not have the expertise to suggest on Stocks. Thanks for creating such nice informative Blogs about Mutual Funds. MySelf Nilesh Patil – Age -32 Yrs and working as NRI. Dependents – Spouse and 2 Yr Daughter. I am investing in Mutual Funds and planning to invest 10K (total) more fund for SIP Long term one for 20 Yrs. .
My goal is to achieve at least 2 Crore during retirement (At the age of 55-60) and should have 50 Lacs for my Daughter marriage and Education at her age around 21 – 25 Yrs. Also I have taken Max Life Term insurance plan of 2 Crore in last Nov-2017 and will continue for next 28Yrs and Coverage will be till my Age 72. 1) Kindly suggest the best MF / MIP / ULIP or any other Plans which is better for Long term with TAX Saving and good returns with Low Risk and Moderate Risk. All the three mentioned funds are good ones. But, may I know the reason for opting for Dividend payout for the fist two equity funds. Do you/family have health insurance cover? 1)Currently I have Family health insurance covered by Organization(Dubai). I am planning to take Health Insurance for ourself End of this Year in India . 2) About First two equity Funds I am going to cancel. I know you already shared the details about requested details. But I am not able to clarify the details. I need still your suggestion to choose any other plans apart from MF like MIP/ULIP or should I go with only MFs to achieve my Goals (2-3 Crore) within next 20 Yrs considering mentioned New portfolio. Appreciate for your Help and guidance. Kindly read : Should NRIs buy Health Insurance in India? 2 – The new portfolio has two large-cap oriented ones, Brila frontline & Kotak select. You may keep either of them and add one diversified equity fund to your portfolio. MIPs can be considered for medium term goals. As of now, you may avoid ULIPs. MFs can be a better choice. Kindly review it and suggest if any funds to add or change the SIP amount to achieve my Goal of 2-3 Crore in 20 Yrs. If we check the portfolios of Kotak Select focus & SBI bluechip funds, they overlap by around 45%. So, advisable to keep either of these two funds. Kindly refer to my article on MF overlap. The rest of the funds are fine. Could you please suggest for below mentioned points. Please recommend (Point No 2) as alternative best MF considering for Long term around 20 Yrs. You may add one balanced fund like HDFC balanced fund to your portfolio. As you have very long term view, you may allocate higher amount to Diversified and mid-cap funds. SBI bluechip has a lower Standard deviation than Kotak fund and also has a slightly longer track record. Apologies for asking many queries. Its personal request could you recommend best MFs considering Long term SIP (20 Yrs) and suggest new MF portfolio for better returns along with respective amount in each MF. I can invest per month 22,000 Rupees. Accordingly please mentioned the details. For exact amount allocation based on the required corpus, my suggestion would be to consult a fee-only financial planner. That would be a better decision! SBI blue chip, Aditya Adv, Franklin Smaller cos fund, Mirae Emerging & Franklin Prima fund. As per your recommendation I am going to start below mentioned new MF portfolio Apr-2018. Kindly let me know if any changes required. Getting great MF Advisor like you will be the best to ready in advance for the financial goals. Thanks for your kind response and help. Kindly go ahead with your investment plan. Be prepared for volatility as returns from mutual funds are not guaranteed. Kindly try to maintain a diversified asset allocation. Besides equity oriented schemes, do have debt securities in your overall investment portfolio. I am not completely understand about points which you referred. 2) Do have debt securities in your overall investment portfolio —> Please elaborate this point and recommend about Debt Securities too. Apologies for asking many queries. As I am not aware about all this financial investment plans or Methods at all. Asset allocation example : Say I have to invest Rs 100 then I can consider investing Rs 30 in safe product like PPF and the remaining Rs 70 in equity oriented schemes. Like-wise there are many investment and savings options that one can consider based on his/her investment profile and financial goals. Here PPF is a debt oriented product. Thanks for sharing such a wonderful blog Srikanth. 1) You can switch between Debt and Equity several times & anytime. This is completely Tax free. Unlike in mutual funds where regular switching, redemption & buying involves taxation and costs. 2) The ULIP illustration mentions all the costs to the last penny. including broker fees. In MF’s, you are aware of the Fund charge, but you will be rarely made aware of how that charge value is arrived at. 1 – If I am investing in Equity oriented portfolio, why would any one like to switch multiple times. Too much churning of portfolio is not advisable. Also, may I know your views in case of fund under-performance?? For ex : If I am invested in a Large cap fund (ULIP) and it under-performs, I do not have any other similar option, am I right? Also, in this case why should I switch to other fund say Debt oriented or balanced fund, a change in my original investment objective. 2 – When I am clear of how much MF charge and that too NAV is net off all applicable charges, is it not more transparent than ULIP, especially when we have to calculate the Returns.?? 3 – Kindly note that LTCG tax is also not retrospective in nature. Hi Sreekanth. Huge fan of your blog. 1. Its not about churning. That is not recommended. But taking advantage of opportunities. for eg. whenever the markets are heating up in the equity space, i can switch to debt and vice versa. Also if the investment is goal oriented, i can start switching to debt during the end of period. the cost and tax of switching is Zero. 3. Ofcourse it is. Even with grandfathering clause, you have to pay tax in the future. irrespective of which year you have bought the stock/mf. But in ULIP once the bond is signed, you will never be taxed, irrespective of when the Government launches tax on ulip gains. 1 – Dont you think ULIPs have/offer less number of opportunities/options than MFs, if one really wants to take adv of available opportunities. May I know your views on my point related to ‘non-performance of funds’. As mentioned in my above article, if MFs give superior returns than ULIPs, the tax advantage can be negligible. 2- If I am not comfortable with a distributor, I can always ignore him/her and can opt for Direct Mutual Funds. 3 – Kindly note that Tax laws can not be same forever. The Govt can amend the law and make ULIPs also come into tax bracket just like LTCG tax on equity MFs/Stocks. Excellent and well explained as well as well written blog. I fully agree to your opinion. Do you think, govt will not levy tax on insurance income in future? i don’t think so. In India, only 1% pay tax and to get more tax money govt will think to hit middle class even harder by taxing PPF, EPF and insurance returns. As on today, ULIP may be attractive due to 10% LTCG on MF, but what is the assurance that ULIP money will NOT be taxed in future? Last year they taxed NPS returns. believe me, we may get tax even for breathing air in future. Yes, there is no assurance that ‘tax laws’ remain the same forever! So, let’s think beyond taxes when investing! I would like to start investment, this is the first time i’m investing, so i need your help. i can afford upto Rs.5000 monthly investment. I’m confuse with ULIP plans are better or go with Mutual funds as ELSS(SIP). ULIP Plan – “HDFC Life™ Click2Invest” & “Edelweiss Tokio Life Wealth Plus Plan”. Please recommend best investment method & save our hard earned money also get best returns. May I know your investment objectives and time-frame? Is tax-saving one of your investment objectives? Yes it’s for Tax saving and also saving for future. And time frame is 5+ years. Suggest you to consider investing in ELSS funds for tax-saving and wealth accumulation purposes. How to pick best mutual fund schemes based on Risk ratios? Very good article, looks like MFs are better even with LTCG at this point. But looking at the way many thousand crores are taken away by our colorful billionaires, MFs may not give the kind of returns we saw in the past many years. Who knows how many companies are writing fraud accounts? Also with so much money gone, our gifted Finance Minister may want to increase LTCG to 20%. I mean we have to save our banks right, who else if we don’t? Hence, one has to diversify his/her investments across Asset classes (say, real estate, Stocks, mutual funds etc.,). Equity MFs are still the best investment option for any type of investor (small/hni) for long term goals, as they invest in a portfolio of Stocks/Securities, thus reducing the concentration risk. However, past performance may or may not be repeated. But, let’s have a realistic return expectation. I am confident that one may not get disappointed in the long-run. Lovely , comprehensive comparison , Sreekanth ! You have been lucid with topic ! As concluded by you, Mutual Funds are simpler to understand and less complicated with hidden charges . As such, Fund Management expertise is severely lacking with the ULIP administrators and in my case, I was trapped into subscribing to one them , AVIVA Life Insurance by one of the agents associated with Indusind Bank , marketing their products. He mis-sold a policy of Rs 1 lakh per year premium , which was losing its capital value right from Day One and I was forced to stop it with a loss of about 35,000/- after three premium payments . The claim that it will pick up only after 5 years of holding is simply a Misleading One as the officers sleep on this cushion of time ! An FD or RD of this premium amount would have added at least Rs 35,000/- more , so in essence, by believing in these marketing tricksters, I lost more tha Rs 70,000/- !! I WOULD STRONGLY ADVISE ALL SMALL INVESTORS TO BE ONLY WITH ELSS AND NEVER, EVER GET TRAPPED BY THE ULIPS . Thank for you sharing your real-time experience! Most of the ULIPs come with high costs, especially during the initial few years, as higher % of costs are ‘front loaded’. 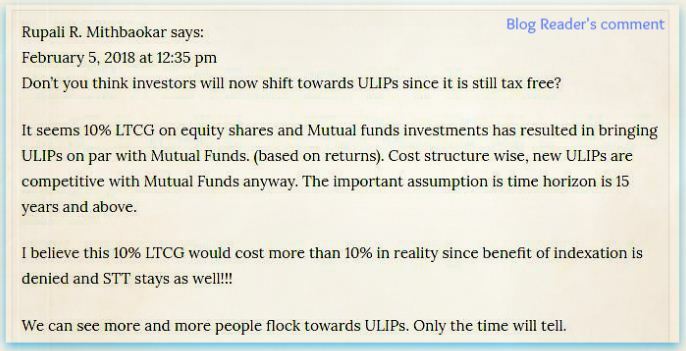 So, if one wants to get decent returns from ULIPs (if invested), has to remain invested for long-term.